Prescription savings in the palm of your hand. The Free Rx iCard App is now showcased on 50 statewide programs promoting Rx savings! 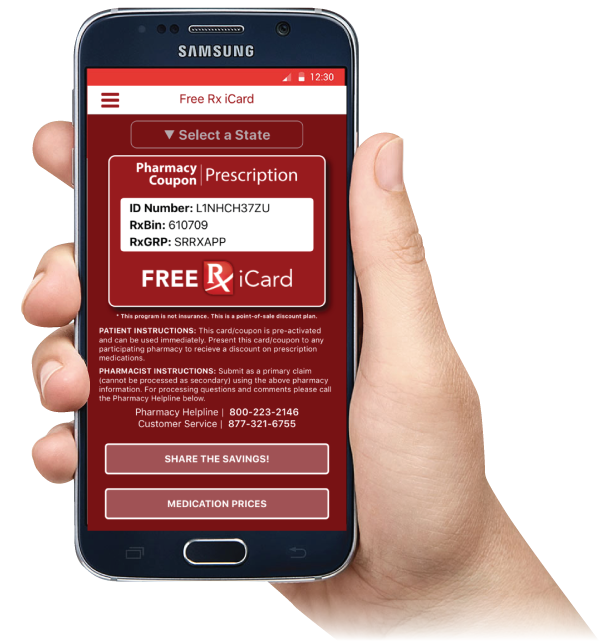 Present the Free Rx iCard app to any participating pharmacy and start saving on prescription costs. If you have insurance, Free Rx iCard can be used to provide savings on medications that are not covered. All prescriptions processed through the program are completely confidential. This is not a medicare prescription drug plan. Program is privately supported. This is not a government run/affiliated/funded program. © 2005 – 2019 Free Rx iCard | All rights reserved.